Sometimes a manager loses it and reaches a point where he must admit that perhaps the game has passed him by. Like a golfer who suddenly gets the yips he must accept that, whatever it was that made him capable of doing the things he once did, it ain’t in him no more. None of it. Arsene Wenger looks increasingly like a man whose best days are long behind him. The Arsenal manager has now gone seven years without winning a trophy, and even a heavily labored 1-0 win against Queens Park Rangers on Saturday — thanks to a goal that looked suspiciously offside — did little to suggest that things will be different this season. We are still in the thick of autumn, yet Arsenal already look as if they will be a footnote in the story of how this season’s Premier League title was won. After consecutive losses against Norwich and Schalke, Wenger admitted last week that, with less than a third of the season behind them, his team has hit a wall. You wonder if any of it matters to the longtime Arsenal boss, who said last week that qualifying for the Champions League was more important than winning a trophy. Wenger, who has an economics degree, has turned Arsenal into a money-making enterprise, making a profit in an era when Chelsea and Manchester City continue to rack up record losses. But he is now in danger of becoming a parody of himself, a man who elevates everything over the result itself. I’ve always been fascinated with the Arsenal manager because in a world where only wins matter, he posits that there is something bigger than winning. For him, football is an abstraction, a game in which aesthetics are valued as much as, if not more than, trophies. He continues to construct a team that entertains its fans, punches above its weight in Europe, and eventually falls agonizingly short of what’s required to win silverware. There was a time when it wasn’t always like this, when Wenger won trophies while entertaining. Arsenal won its last Premier League title with a team that cost slightly more than Manchester United paid for Rio Ferdinand. The team included World Cup winners Thierry Henry, Patrick Vieira, Robert Pirès, and Gilberto Silva. The combined cost of the starting back four of Ashley Cole, Sole Campbell, Kolo Touré, and Lauren was less than seven and a half million pounds. Wenger hasn’t lost his eye for cheap talent, and right now I’m sure he is looking at video of a 16-year-old from Kathmandu who has a silky first touch. You could build a great starting lineup of ex-Arsenal players from recent years. In defense you have Ashley Cole, Gael Clichy, William Gallas, and Touré, a midfield four of Cesc Fabregas, Alex Song, Samir Nasri, and Mathieu Flamini, with Robin van Persie and Emmanuel Adebayor starting as forwards. That list has to make for painful reading for Arsenal’s fans, as it is clear now that they are a feeder club for the Premier League and the rest of Europe. No other conclusion is logical. Ever since Roman Abramovich shifted the financial goalposts and Manchester City’s ownership group moved them even further, Arsenal has found it difficult to compete. The talent Wenger nurtures eventually jumps ship for bigger salaries elsewhere. Robin van Persie more than doubled his wages when he left Arsenal for Manchester United, and it’s likely that Nasri did the same going to Manchester City. It’s easy to look at these players as mercenaries, but the truth is they went to clubs that not only gave them more money but also offered them a better chance of winning. Ashley Cole won the Champions League with Chelsea; Clichy, Nasri, and Touré won the Premier League title with Manchester City; and you wouldn’t bet against Song and Cesc winning something this season with Barcelona. In the current financial climate, Arsenal are already priced out of big-name players long before the bidding starts. Arsenal was one of the first clubs in England to be interested in Eden Hazard, but once the Belgian star became available the choice was between Manchester United and Chelsea, as Arsenal could not stump up the eventual transfer fee of over £30 million. The danger is that if Arsenal go chasing waterfalls they just might drive themselves off a cliff. They have reason for concern; the recent financial struggles of teams like Portsmouth and Rangers serve as signposts on the dangerous road ahead. Even well-established European giants like AC Milan are feeling the pinch, as a wage-slashing summer sale of their top talents has the club nestled firmly in a relegation battle in Serie A. Spending more won’t guarantee trophies, but it’s hard to ignore the fact that in Europe’s top leagues last season the wealthiest clubs in each competition — Real Madrid, Juventus, Manchester City, and Porto — all won the league title. Paris Saint-Germain spent their way to second in Ligue 1, racking up 79 points, a record for a second-place team in France. Borussia Dortmund in Germany seem to be the exception to the rule. 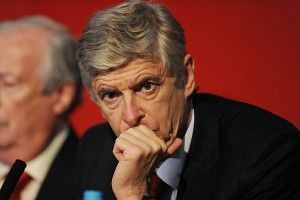 Wenger has said frequently that Arsenal cannot compete with its wealthier rivals, and he seems to be weathering the storm until UEFA’s Financial Fair Play rules make an impact. It’s unclear, though, how much that will change Arsenal’s fortunes as the club falls further down the Premier League pecking order, having been leapfrogged by Manchester City and Chelsea in recent years. If Wenger wants Arsenal to be anything more than an inconvenience for the Premier League’s top sides on their march to the title, he needs to loosen the purse strings and spend, but doing so would require admitting something to himself: It is time to accept that his vanity project of pretty football has failed, and that Arsenal are now little more than lovable losers. If Wenger cannot win in this brave new world and bring Arsenal fans the success he once did, he should step aside and give someone else an opportunity. That is if the majority owner, Stan Kroenke, wants fans to believe that he cares more about winning than about turning a profit. Wenger has taken the club as far as he can. One day there will be a statue of him outside the Emirates Stadium. He deserves it. Arsenal fans are fond of saying “In Arsene We Trust.” He earned their trust with a track record of winning in his early years. With another trophy-less season very much a possibility, how much longer can the owners and Arsenal’s fans afford to entrust Wenger with the future of club?